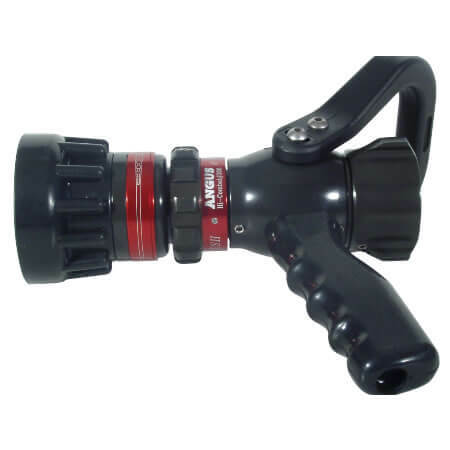 The Falcon Selectable Flow Water & Foam Nozzle provides professional fire fighters with a range of flow combinations to meet their needs without having to leave the area of the incident to change nozzles. This increases foam application when used in conjuction with the optional foam tube. The light alloy, ergonomically designed pistol grip, and trigger on/off control enable the nozzle to be directed at the same time as the flow rate and spray are adjusted. The Falcon Selectable Flow Water & Foam Nozzle flow rate can be set via an easy grip ring on the body to one of 5 pre-set positions. Once operations are completed the flow adjuster can be set to a “Flush” setting to ensure any foam or debris is flushed from the nozzle. Every Falcon Selectable Flow Water & Foam Nozzle is etched with a unique serial number before leaving the factory. The number can be used to log each nozzle into inventory and to track equipment in the field.